We took a side trip in Utah to a treasure - Bryce Canyon National Park. It's a 20x2 miles side trip, but we had been there before and knew it was worth it (especially for one lucky to have a National Parks senior pass). The hoodoos are amazing. Differential erosion caused thousands of little castles and/or featureless people. Just 20 minutes viewing the "silent city" at Inspiration Point is worth the side trip. And it was a beautiful day and a foot or two of recent snow made it more beautiful. Utah maintained its reputation. There were mountains visible from border to border and it was always beautiful to a mountain lover like me. After we got into Arizona we had 20 or so dull miles, then mountains again most all the way to Phoenix. Phoenix has mountains, but only one really big one - Camelback. And our first day was bright sun and near 80! 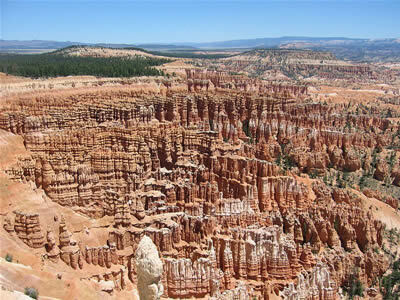 The photo: A typical view: Because Bryce is amphitheaters on the edge of a plateau, most viewing is looking down like this, unless you hike down into it. Click to enlarge.